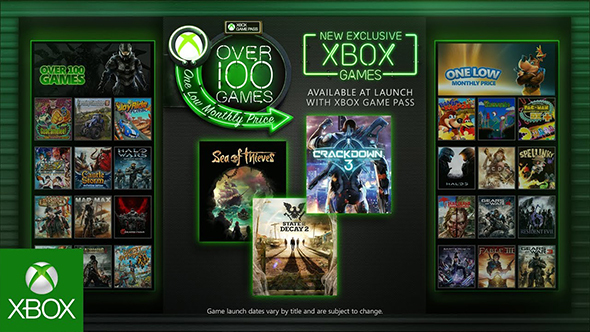 Earlier today, Microsoft announced that their Xbox Game Pass program would feature all upcoming first-party games on the same day as their retail release. That was big news for Xbox One owners, but it turns out that it’s big news for PC players, too – cross-platform games available through the service can also be played on PC with the subscription. That’s according to Xbox’s marketing chief, Aaron Greenberg, who responded to that very question on Twitter. There are several caveats to be noted. The game in question needs to be one of those specifically-branded Xbox Play Anywhere titles, and that means it’ll be a Windows 10-exclusive version to be downloaded from the Microsoft Store. A large number of the Xbox Game Pass games currently available are console-exclusives, so that means the subscription isn’t necessarily worthwhile if you’re not also playing on Xbox. But with the knowledge that games like Sea of Thieves, State of Decay 2, and Crackdown 3 will all be coming to the service, the $9.99 monthly subscription starts to make a lot of sense even as a de facto rental option. Assuming that Microsoft continues their current cross-platform strategy, future sequels Halo, Forza, and Gears of War could also be possible for PC players using the subscription. It’s now essentially a Netflix-style subscription for games, something that’s felt a long time coming between the games given away by PlayStation Plus and Xbox Live subscriptions, and the general move toward games as a service. With Microsoft’s biggest new releases coming day and date through the subscription – and on multiple platforms – it’s a massive step.